I LOVE a big pot of chili during cold winter months. Chili itself is always easy to make, even when you make it in bulk. 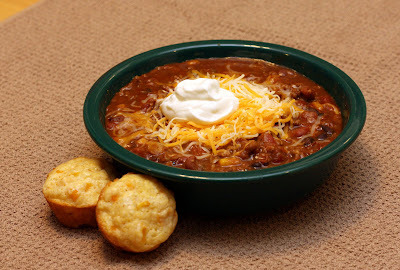 One of my favorite things is that it not only tastes great reheated (I usually like it better on the second heating when the flavors have melded), but that it also freezes well, which is useful when you make gallons of chili for only 2 people! I haven't followed the same recipe more than once lately, and this recipe was basically made to use what we had in our freezer/pantry, without having to buy much more. The thai peppers in this really give it a kick. (I love spicy foods, and this is some HOT chili!) You could easily substitute dried pepper flakes for a less spicy version. Even though I didn't drain any of the canned items, this is still a very thick, hearty chili after simmering for an hour. In a large pot over medium heat, combine garlic, peppers, kidney beans, black beans, diced tomatoes, chili powder, pepper flakes, cumin and taco seasoning. Bring to a boil, then reduce heat, cover and simmer. While soup is heating, cook beef in a large skillet over medium heat until brown. Drain excess fat and rinse, then stir beef into soup pot. Simmer, covered, until flavors are well blended, about 1 hour.